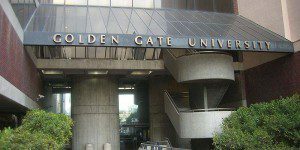 Founded in 1901 in San Francisco, Golden Gate University is California’s fourth oldest private university. The Graduate School of Accountancy at Golden Gate was opened in 1932. In 1950, Golden Gate University initiated Northern California’s first evening MBA Program. Golden Gate University CyberCampus became a model for online education when it began as one of the country’s first web-based learning programs in 1996. Golden Gate University named its School of Business in March 2000 in honor of Edward S. Ageno. The Golden Gate University San Francisco campus is located in the heart of the city’s downtown financial district, and is easily accessible by public transportation. Situated a few blocks from the Bayshore Freeway and the Oakland Bay Bridge, the campus location is convenient for many working professionals who wish to pursue a degree, as it provides a wealth of employment opportunities in the thriving business region surrounding the campus. The main campus is located less than 15 miles away from the San Francisco International Airport. In 2008, a shuttered South of Market warehouse structure was transformed into a six-story, 50,000-square-foot Student Services Center for Golden Gate University. All GGU student services offices (registrar, admissions, financial aid, and so on) are included in the building, along with a bookstore and top-floor conference center. MBA courses are held in the six story Allyne Building, located at 532-536 Mission Street. The university Library can be found on the first floor of the Allyne Building. The Library provides materials and services to support learning and instruction at GGU. There are about 10 full-time faculty and a multitude of adjunct professors located in six departments: Management, Human Resources, and International Business. Faculty members possess priceless business skills gained from experience in global business activities, research, and professional travel. There are around 5,000 students enrolled in Golden Gate University’s undergraduate and graduate programs. On average, students in the school are 34-years old. Golden Gate University offers a traditional MBA, as well as an Executive MBA program, a Doctor of Business Administration and a joint MBA/JD program.